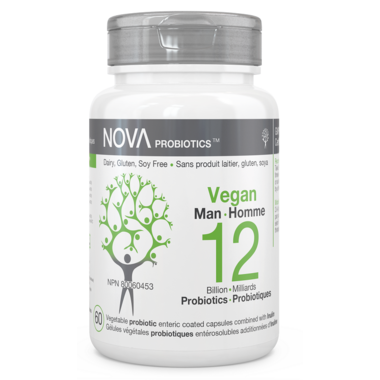 NOVA Probiotics VEGAN Man provides 12 billion live microorganisms that form part of a healthy microbiome. The product is specially designed for use by those who wish to maintain a healthy and balanced intestinal microbiota, and prevent imbalances associated with environmental factors known to compromise gut health such as diet, lifestyle, chlorinated water, air toxins, stress, etc. Directions: Take 2-4 capsules, 2 times a day with meals or as recommended by a therapist. 4 Medicinal Strains: Lactobacillus rhamnosus NVA119, Lactobacillus plantarum NVA139, Lactobacillus paracasei NVA234, Lactobacillus acidophilus NVA116. Non-Medicinal Ingredients: Chicory Inulin (Prebiotic), Vegetable Capsule (Hypromellose), Corn Starch (Non-GMO, Allergen Free), Vegetal Magnesium Stearate, Ascorbic Acid. Caution: If you are on antibiotic(s), take at least 2-3 hours before or after. If you have fever, vomiting, bloody diarrhoea or severe abdominal pain, consult a health care practitioner prior to use. Best probiotic if you have dairy free diet! Keeps me healthy as well from winter colds.